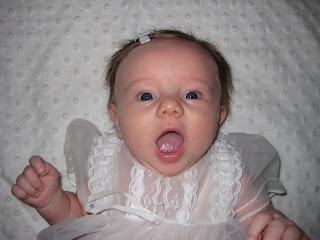 This is one of the funny pictures, she makes priceless faces. 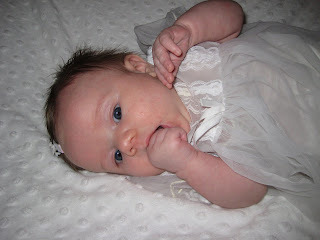 We couldn't get her to take her fingers out of her mouth. 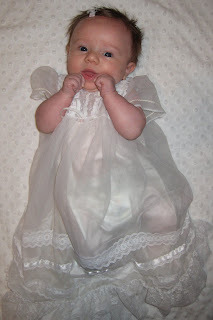 This dress is so beautiful....it originally was the dress Dave's little sister Rae was blessed in, and now all the Callister grandbabies have been blessed in it. 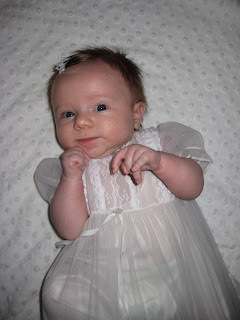 And my favorite, she is so cute!!!! She's such a cutie! I was so happy to finally see her. I loved the blessing Dave gave her. It was so unique and not like all other baby blessing out there. Oh my gosh- she has already changed so much since we last saw you guys!! (Was that 2 weeks ago?) So cute!! Wish we could have been there!